Another mass student-led march will be held across Australia today following news Adani would self-fund its controversial coal mine in Queensland. 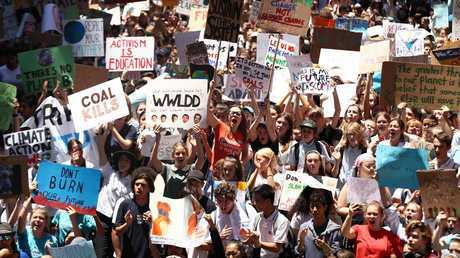 It comes after thousands of students copped criticism from politicians including Prime Minister Scott Morrison for skipping school last week to attend climate change rallies instead. But it seems many Australians don't agree with Mr Morrison's comments that there should be "more learning in schools and less activism". New national ReachTel polling conducted after the Student Strike for Climate Action revealed widespread support for the students. The Australian Youth Climate Coalition released results from the survey of 2345 people, which found 62.7 per cent thought school students had a right to demand action from the Government on climate change. Among Labor voters, this rose to 86.4 per cent. A majority of 58.1 per cent also thought the Labor Party should show leadership on climate change and oppose Adani's coal mine, including 80.7 per cent of Labor voters. Today, students have invited adults to join them at March for Our Future rallies in Brisbane, Sydney, Melbourne and Cairns after Adani announced it would self-fund its mine and start work before Christmas. 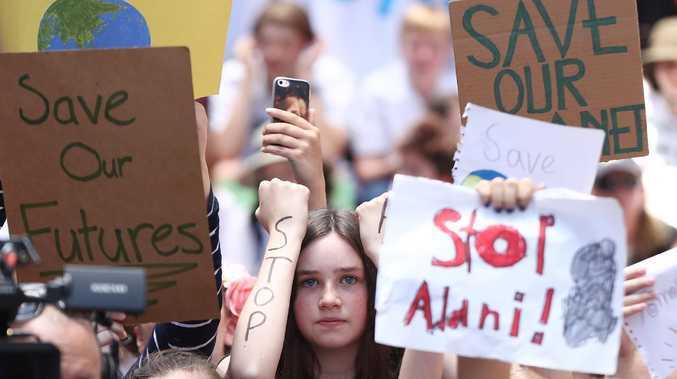 "This new poll shows Australians support the students' actions and that the Prime Minister's attacks on the kids are mean-spirited and out-of-step with public opinion," Australian Youth Climate Coalition national director Gemma Borgo-Caratti said. "The poll also puts Bill Shorten on notice that a clear majority of Australians, and the vast majority of Labor voters, want him to act to stop the Adani mine. "Labor voters want strong leadership on climate change, not a would-be prime minister who says the Adani coal mine would make no difference to carbon emissions." Jean Hinchliffe, 14, said students would continue to push governments to act on climate change. 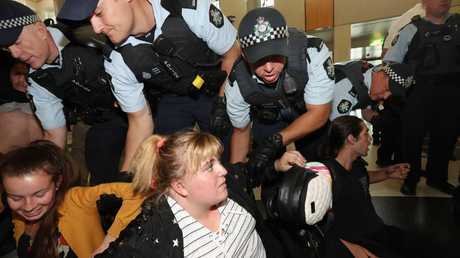 "We're not going to stop until change is made," she told news.com.au. She said young people around Australia were working on big plans for the school holidays and for 2019. The rallies on Saturday will be to protest against the Adani coal mine and Jean said they were opposed to the use of coal for electricity and were also against the development because of the potential impact on the Great Barrier Reef. "It will drive Australia and the rest of the world away from a sustainable future and that's something we don't agree with," she said. 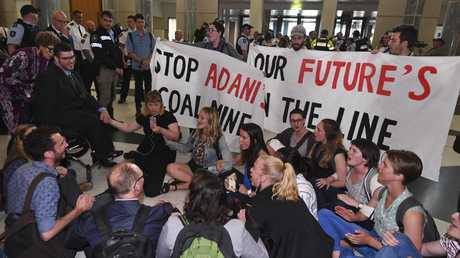 "Young people will not stand by and let Adani dig its mine, or let politicians get away with waving through a project which will destroy our future. "Climate change is breathing down our necks. We're fired up and ready to do whatever it takes to stop Adani." This weekend's protests follow a nationwide student strike last week followed by a "sit-in" inside the lobby of Parliament House this week. High school students staged the protest after their requests to speak with the Prime Minister about climate change were ignored - and it earnt them a three-month ban from the premises. 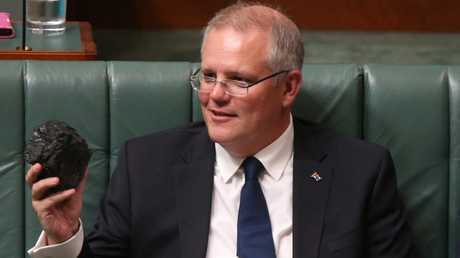 Earlier in the day, Mr Morrison said he would sit down with the school students, a week after he criticised them for skipping school to stage the national strikes. "I'm always happy to listen. I respect everybody's views," he told reporters on Wednesday morning. "We don't always have to agree on everything, you know, but we do have to respect each other and we do have to take each other's views seriously." Despite the PM's words, he's yet to meet with the 100-strong student group, whose protest was moved to the lawns outside Parliament House by security. Crossbench MP Kerryn Phelps and Greens senator Jordon Steele-John both took time to meet with the students. Greens leader Richard Di Natale praised the group. "The reason we had young people in parliament today protesting is because the Liberal and Labor Party are not listening to them," he told reporters. 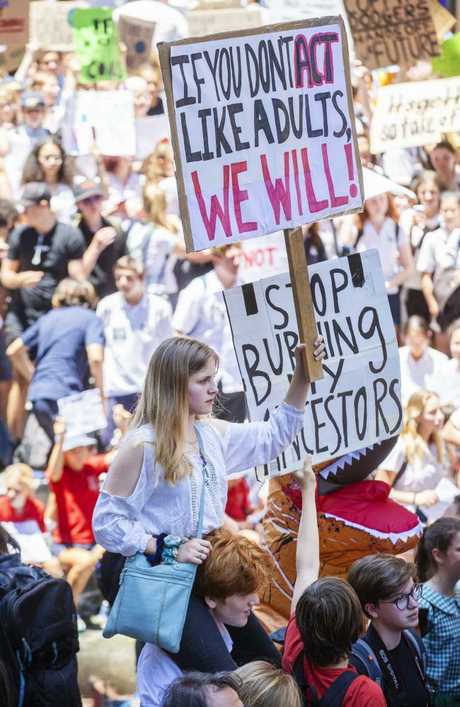 It was a sentiment echoed by the students gathered outside, including 14-year-old Tully Bowtell-Young who travelled solo from Townsville to be there - using her own pocket money to help cover costs. "I think it's worthwhile because nothing I have now is going to mean anything if I don't have a future in this world," she told AAP. The world has already warmed by 1C and global emissions are projected to rise by more than 2 per cent this year due to an increase in the amount of coal being burned and the sustained use of oil and natural gas. In Australia, the latest government data shows greenhouse emissions are at their highest level since 2011. A leading climate scientist suggests Australia will now have to reduce electricity sector emissions by 60 to 70 per cent in order to meet its Paris Agreement target of reducing carbon emissions by 26 to 28 per cent on 2005 levels by 2030. "It's clear that nations around the world aren't doing enough to slow down climate change," Griffith University emeritus professor Ian Lowe told ABC radio on Thursday. Even Australia's now-dumped National Energy Guarantee aimed to cut emissions by 26 per cent. Some argue that Australia only contributes to about 1.8 per cent of global emissions but Prof Lowe said every nation except the US and China was in the same position - and together these emissions contribute to the majority of emissions. "It's all of the one and two per cents from all of the little countries that add up to the other 60 per cent outside the US and China," he said. Recently a special report from Intergovernmental Panel on Climate Change (IPCC) revealed carbon emissions would need to be cut by 45 per cent from 2010 levels by 2030 in order to keep global warming to 1.5C. To achieve this, the use of coal for electricity generation would have to be slashed to practically zero by 2050. If warming is allowed to reach 2C almost all the world's coral reefs would die including the Great Barrier Reef. Even if warming reached 1.5C, most would still die. To even save half the world's reefs, warming should be limited to 1.2C. Representatives from nearly 200 countries will hold talks at a UN Climate Change Conference in Katowice, Poland focusing on the rules for implementing the Paris climate accord. But federal Environment Minister Melissa Price was unable to get a joint statement on climate change signed off by state environment ministers to take with her to Poland on Saturday. 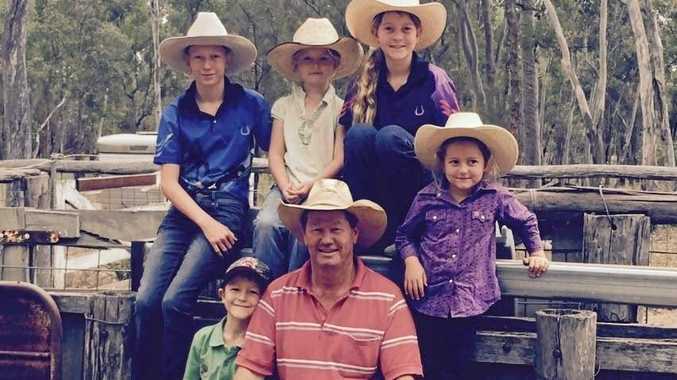 Ms Price met with her state counterparts in Canberra on Friday and asked them to endorse a statement but they refused because the government has no plan to tackle the problem. "The science is frightening, unequivocal and clear - we are running out of time," the statement said. "Yet the response of successive Liberal prime ministers has been one of delusion and deliberate inaction. #StopAdani rallies are being held today, Saturday, December 8. Melbourne: 10.30am-12.30pm, meeting outside the State Library of Victoria then marching to Flinders Street Station. Facebook event here. Sydney: 11am-1pm, meeting at Town Hall Square then marching to ALP Headquarters, 377-383 Sussex St. Facebook event here. Brisbane: 9.30am-11.30am, meeting at Adani Headquarters, 10 Eagle St, then marching to Queensland Parliament. Facebook event here. Cairns: 9am-11am, meeting at Cairns Esplanade Lagoon. Facebook event here.